The CPU soldering on the mainsail and Desoldering are controlled by two independent microprocessors. 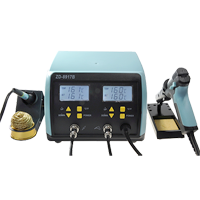 With the digital temperature control and high-quality sensors, set during the soldering tip temperature is accurate and constant. Thanks to these properties, and high-powered soldering iron is ideal for lead-free soldering. Mounted air pump is characterized by quiet operation o. At the station is displayed set temperature and current, displays are illuminated in blue. Soldering on the tip - has the power of 48W, the opportunity to exchange the mainsail, designed for general use. 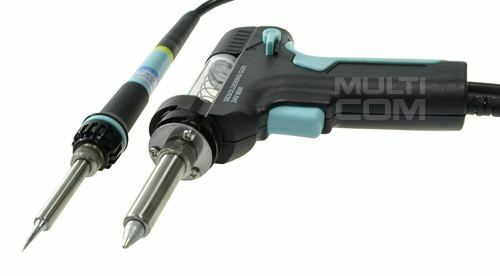 High power and ergonomic design make it easy to work with a soldering iron. The heating element is made of PTC, by a temperature sensor caves is a constant and precise temperature setting. 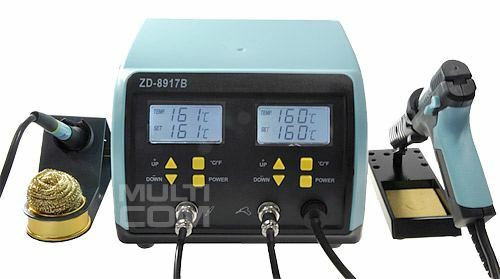 Desoldering device is suitable for brazing all the electronics and allows easy removal of the remains of the tin. The temperature sensor located at the cave ensures accurate temperature stabilization tip. High power resulted in a rapid heating of tin, so you do not overheat the wlutowywanych elements.